Women determined on revenge against those who wronged her can be just as dangerous as a threatening natural disaster. This is certainly the case with the title character in the thriller, ‘Saving Grace B. Jones,’ which will be released on DVD on May 27 by Arc Entertainment, and will retail for $20.99. With the release of the drama on DVD, Shockya is giving away two DVDs of the movie. 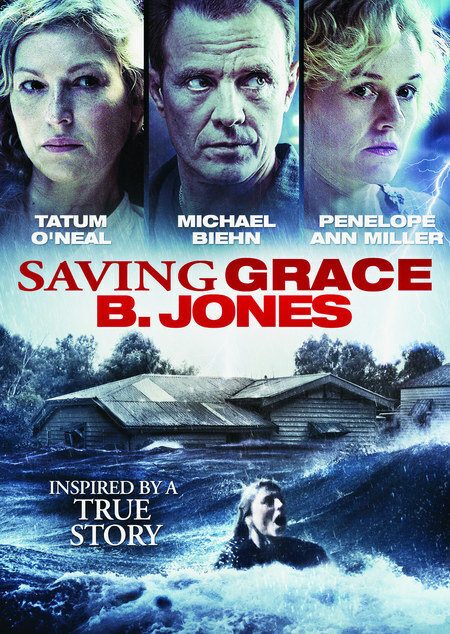 To enter, follow us @Shockya and tweet us the phrase: “@Shockya is giving away two Saving Grace B. Jones DVDs! Follow and RT to enter!” You have until the day the DVD is released, on Tuesday, May 27, 2014 to enter. You can enter the contest once daily. After May 27, we’ll pick the winners at random and notify them through Twitter. Good luck! ‘Saving Grace B. Jones’ was helmed by first-time feature film director, Connie Stevens, who co-wrote the script with Jeffry Elison. The movie, which was inspired by true events, features Michael Biehn, Tatum O’Neal, Penelope Ann Miller, Piper Laurie and Scott Wilson. ‘Saving Grace B. Jones’ takes you to a 1950’s small town in the Midwest, where a gentle family man, Landy (Biehn) and his wife, Bea (PMiller), fight to release his sister Grace from a state asylum for the insane. Grace (O’Neal) was sent there after a horrible incident on her wedding day 20 years before left her mentally deranged. Landy brings her home but the local townspeople are distrustful of this damaged woman who alternates between quiet acceptance and wild rants. They soon have bigger problems when a horrific rainstorm threatens to flood the town. In the midst of this natural disaster, Grace experiences a crisis and sets out on a deadly rampage to destroy those who cross her. The unrelenting rain masks the true pathological extremes of an unhinged woman bent on revenge.